Hey guys, after years and years and years about hearing how cool the IRC #forums are and how everything of any momentousness on the Internet takes place on there, I want to get in on the action. Any tips on what client to use? Is there one that works well on both Windows and Android? And what #chatrooms are worth checking out? To a lesser degree, what’s the relationship between IRC and #Riot / #Matrix, if any? In an attempt to stem the tide of #gplusrefugees flocking over to MeWe or some other siloed site because "OMG there are communities!!" I figured let's start building up the forum presence here in an attempt to drive some traffic this way. Thus: I have created a Board Games Forum for discussion of all things Board and Card Games. Join now! Friendica, as a macroblog (ie. unlike microblogs such as Twitter or Mastodon), is probably the most powerful and most connected out of them all. It can import from Twitter, G+, and others and also export to many networks. But one concept to grasp is that it does not have groups/forums linked under your Profile. Everything is a separate Profile. So you create a Profile and set is as a personal, forum, or whatever type and then give it attributes. This is quite powerful as you can also set each one to mirror (import) posts from a different source. 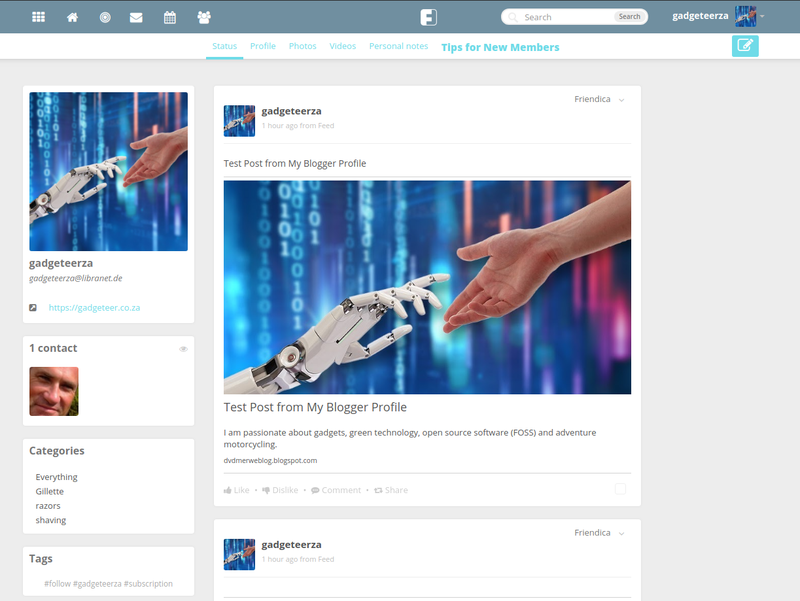 So I created a separate Forum on Friendica called Gadgeteerza for my tech posts. It imports from an RSS feed (I'm testing out Blogger for this right now as I need a good quality RSS feed as a source). The forum can be found at https://libranet.de/profile/gadgeteerza and is separate from my personal profile. I see on your personal profile you can actually also create "additional profiles" and then switch between them so that may be another way of doing it. 1. I added a new contact to that forum and gave the RSS feed as its address. Then I set that contact to "mirror" posts to my feed. One note here, not all instances of Friendica allow you to add and mirror contacts as RSS feeds and this is why it did not work on my personal profile instance. 2. From my personal profile, I can create a post and just mention the name of the forum with an exclamation in front (eg. !gadgeteerza) and that pushes the post to the forum. But in this way it posts as my personal profiler and not as the Forum. So yes I may also use Friendica as my source to create posts. It all depends on how well I can make it gel together. Not as in being moderate, but as in moderating online discussions. And ... I could try to write this all up in a post, but I think I'm going to have more fun as a give and take in comments. So that's how This Thing will be Done. * I'm co-moderating (with about 12 others, of whom roughly 4-5 are active) a 3,000+ user G+ community, as well as a much smaller one. * I've got mod chops from Reddit and a few other forums over the years. * There's a lot of thinking going on about What Come Next and the tools people would like to see. * I'm also subject to being moderated on a few forums. Some better than others. * As moderator, moderated, and watching the interactions between mods (myself and others) and contributors (some in good faith, others not, some just hard to keep in line), and various community dynamics, sorting out power and how/when to use it is interesting. * Amount and accessibility of information is a constant factor in all this. * What's too much moderation, what's not enough? * Moderation as solo act vs. teams. Those are the bits I've got in mind. More later, but I thought I'd drop a tent peg and see what comes up around it. Or, in the alternative, You may Choose to Write on my tendency to Capitalise Words for emphasis. Or Not. I've just opened an account on #friendica, and I'm trying to figure out how this works. Do people post #newhere posts, as they do on Diaspora? Have to start somewhere, so - I'm trying to understand #forums. I've read the support page, but it's hard to follow. Do forums function like facebook groups? Is there a directory where I can see what forums exist? I see I'm listed as a 'guest' when I look at the the support forum - is that different from a forum member?